Nikki gets dragged from her ordinary life in fashion design school and dropped–along with her cat Momo–in a strange place called Miraland. There, the enigmatic Queen Nanari tells her that she has a destiny that is tied to the fate of Miraland. Not that that actually tells Nikki much. But what an odd place she’s landed. It seems that fashion design is a huge thing here; conflicts are even resolved through design competitions! Looks like her design skills are going to be tested as she meets new people, learns more about the land and its people, and tries to figure out what on earth Nanari was talking about. Now if only Momo could find a satisfactory supply of grilled fish, they might be in business. I generally don’t play mobile games much–like, ever. But Love Nikki is one that I’ve actually enjoyed. It’s basically a fashion design/styling game, but it has a lot more to offer than it looks like at first glance. You’ve got a main storyline in which you encounter other characters and advance along a storyline. It’s not too complex, but it’s cute, and the fashion competitions there are pretty challenging–but there are plenty of tips to help if needed. There are also two levels, if you need a bigger challenge. There are also a number of other arenas in which players can engage with each other, whether competing directly against each other or teaming up in associations to complete tasks together. Plus, the publishers are really good about keeping fresh events to keep some variety. You also have several options for getting outfits–as rewards for completing levels, by purchasing them in the store(s), by completing special events, or by crafting them yourself. There’s a wide variety of outfit pieces to choose from (like, seriously huge), and they’re attractively created. Overall, the whole game aesthetic is really cute/pretty–kind of an anime sort of style. There’s definitely some strong Japanese influence (I think maybe it’s originally Japanese and has just been translated, actually). But yeah, the gameplay is pretty fun, and the style is cute. Plus, it’s free (okay, you can pay for extra stuff, but it’s entirely possible to play completely free, so why on earth would you pay for it?!). I would definitely recommend Love Nikki for those interested in an above-average mobile game. Note: You can find more information on the game, including lots of helpful tips at https://lovenikki.world/. An elderly man lives alone in a single room above an ever-rising sea, smoking his pipe and reflecting quietly. One day, he accidentally drops his pipe through a hatch in the floor, prompting an unusual purchase–a diving suit! And once the man has begun his descent through the flooded levels of his home, he finds himself remembering, reliving his life in reverse from times with his grandchildren to his daughter’s growing up to early memories of his wife. It’s no wonder he chooses to stay in a place so rich with memory, even if he must fight the floodwaters to do so. Wow, speaking of floodwaters . . . I cried buckets in the short time it took to watch this anime short film. I cried at least as much on the second viewing, possibly more. It’s just that sort of story. The sepia-toned, granulated illustration style carries an immediately nostalgic feel. And the music is just perfect–beautiful and enchanting, reflective without being depressing. I loved that the entire short was completely without dialogue; no translation needed for the universal impact of the story. I also loved the way the story challenged my perceptions–I started out feeling sorry for a lonely old man and ended up nostalgically happy knowing that he had a good life, people who loved him however crotchety he may have been. Incidentally, I also liked the way the illustrations reminded me of Shaun Tan’s illustrations; it’s quite a nice and unusual style. 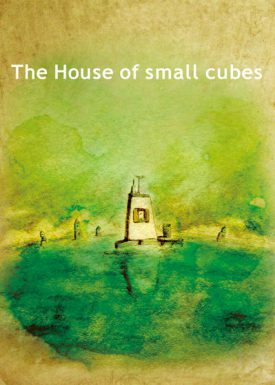 Seriously, The House of Small Cubes is less that 15 minutes long, so there’s no reason to not at least give it a try. Highly recommended. Satsuki, her father, and her little sister Mei move to an old, slightly decrepit house in the country to be closer to the hospital where their mother is being treated. It’s a big change, but it’s also an adventure, and both girls are delighted, especially when they find the house is inhabited by soot sprites–tiny spirits that the adults can’t even see. Even better, Mei encounters a large, friendly spirit calling himself “Totoro” during her explorations while Satsuki is at school. (Satsuki’s a tiny bit jealous about that.) But one rainy evening when the girls go out to meet their father’s bus, Satsuki gets to meet Totoro as well! It seems that not only are their new neighbors glad to welcome the family to the area; the forest spirits are as well. Good thing, too, because it will take everyone’s help when Mei goes missing. My Neighbor Totoro is one of those movies that never gets old and that has something for everyone. My two-year-old niece adores it, and my dad does too. It’s a wonderful story for many diverse reasons. Just as a start, the animation and the music are wonderful. Joe Hisaishi has some of the most interesting and beautiful film scores out there, and the score for this movie is no exception. And yes, the art isn’t always as detailed in some scenes as the modern CG stuff that’s created today, but the form, the details that the artists choose to capture, and the overall flavor of the place and time that is evoked is absolutely stunning. The characterizations of the children–everything from the art to the scripts to all the tiny details–is incredibly captivating and believable. Satsuki is the quintessential big sister trying to hold it all together and mother her little sister while still being just a kid and worried about her mom’s health herself. And Mei is so full of whimsy and imagination and childish impulses and mannerisms. I love the way in which the culture and community of a rice-farming community in late 1950’s Japan is presented, too, with all sorts of details. And the way in which the wonders of the spirits and traditional beliefs and fantasy are all woven in is just lovely and charming. 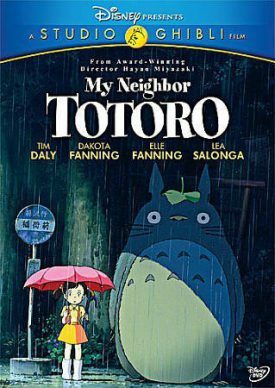 In short, My Neighbor Totoro is a sweet, lovely animated movie that I would highly recommend to basically anyone of any age. Note: I watched the 2005 English dub for this movie. It’s excellent.